seat exciting. I await the next episode with the greatest impatience. Crisis comes to Mathomdale. No sooner has Lady Mathom, with the aid of Eugene Collette, identified the intruder in the valley than the assassin makes his move to target Jennifer. Belatedly, Her Ladyship initiates a security alert but the killer has already laid his trap. Things start to unravel quickly as a hurricane bears down on a valley still choked with people for the summer festival. Jennifer’s life is in mortal danger and the situation escalates to imperil others including Julie Hawthorne and even Lady Mathom herself. Volume 13 in this epic saga in Mathomdale! Things are boiling nicely to a head in Mathomdale. The Summer Fair is still in full swing and the fate of many slaves remains unclear. The Lady Eugene agonises over her three young charges, the first new slaves begin to arrive at Mathom Hall, Aasha and Sahra are placed up for sale at the slave auction in the Mathomdale Arms and Margaret Wilkinson discovers some new and startling facts about Julie Hawthorne; facts that put into perspective the increasing interest in the sale of that young lady. Lady Mathom’s speech at the opening ceremony of the Mathomdale Fair has galvanised the people of the Line of the Goddess. Her command to find places for all the young people displaced by the war sets off a frenzied slave market as more and more families rush to register for slave ownership and haggle over papers of indenture, The Lady herself sets a good example by seeking out new young slaves to raise to the order of the Amethyst whilst Eugene agonises over the status of her own three slaves. Events are moving quickly in Mathomdale. While the slaves of the House of Mathom are embroiled in their own turmoil, newcomers are arriving by the day as the valley gears up for its summer festival. Rebecca is tormented by her own demons, Jennifer is still shocked by the revelations of her parenthood, Julie’s status is more confused than ever and Darren must meet the most extraordinary inhabitant of Mathom Hall yet. 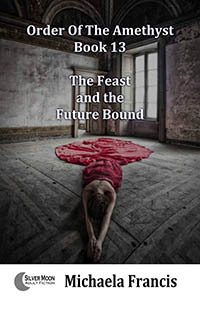 eroticism, corporal punishment, Scifi, and edge of the seat adventure. The latest sizzling adventures in Mathomdale! These are troubled times in Mathomdale. 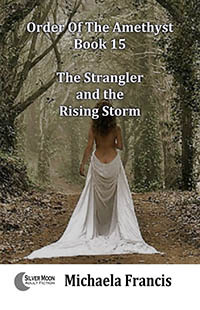 With Julie’s troubles still unresolved, Jennifer must protect her from afar by making a pact with the devil and submitting herself to the caress of Baxter’s whip in the Low Woods. Yet there is an even greater peril lurking in the valley for Jennifer as she is stalked by a mysterious figure intent upon her murder. Meanwhile, as the valley gears up for its summer festival, new young slaves, the flotsam of war, are arriving to be bid upon by the ruling houses and terrible secrets are about to be revealed. All is not well in Mathomdale. In the days leading up to the summer festival, Jennifer finds herself incarcerated behind the walls of Mathom Hall. Meanwhile her beloved Julie is undergoing trials of her own; finding herself torn between two families who wish to purchase her. Julie must sell herself in slavery to rescue her family from ruin even though she knows she is selling herself under false pretences and that her sale will separate her even further from Jennifer. When Jennifer, the newly inducted slave of the House of Mathom, completes her initial instruction in the cellars beneath the Hall, she is released from captivity to languish for a few while in the Oriental Gardens; the huge and beautiful pleasure park of Mathom Hall known to its slaves as “The Garden of the Goddess”. There amidst the magic of the gardens, Jennifer must endure her most poignant whipping yet and, with Rebecca and Robin, discover new vistas of sensuality. 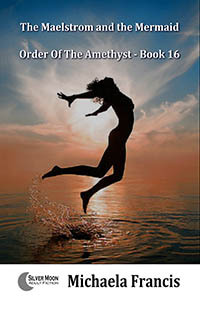 The newly enslaved Jennifer is confined naked, in the cellars and caverns beneath Mathom Hall, to begin her training in the Order of the Amethyst. Here, under the guidance of her mentor, Rachel, she must face her sternest tests yet; daily whippings, ordeals to test her courage, demands upon her intellect, challenges to her fortitude and initiation into some of the deepest secrets of the Line of the Goddess. After learning the dreadful truth that her own mother has sold her to Mathom hall, Jennifer must now face the most critical decision yet. Should she flee the valley forever or should she walk of her own will into slavery and accept the manacles of the purple eyed Mistress of Mathomdale? At this crucial juncture in her young life Jennifer is tested severely. Lady Mathom has mated her beautiful slave Rebecca while, back in Mathomdale, Jennifer must face her most daunting challenge yet. She is nominated, at Lady Mathom's bequest, for the ceremonial role of “Festival Queen” at the valley's summer festival. It is more than just some frivolous title however. 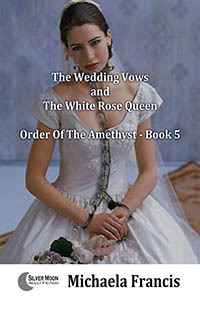 Jennifer comes to realise that the role is a pagan tradition, demanding humiliating sacrifices of her and just one more link in the chain to bind her to the House of Mathom and pledge her in marital union with the Order of the Amethyst. After Lady Mathom gives her beautiful slave, Rebecca, to Robin, she commands him to take her away for a few days vacation at Bolswick Bay. There, at the beautiful seaside village, the young lord of Mathom Hall must learn to be master to his new possession. In this he is aided by the mysterious lady of the Line of the Goddess, Eugene, who will teach him mastery over Rebecca. Following the fateful meeting between the charismatic Mistress of Mathom Hall and the youthful Jennifer Walstow, events take a bizarre turn in Mathomdale. Jennifer becomes embroiled with Lady Mathom's beautiful slave, Rebecca, leading to a night of unforgettable passion with her and Jennifer's girlfriend, Julie. Julie and Jennifer's Adventures Continue! Life has been confusing for Jennifer since her exile in Mathomdale as she is torn between the excitement of her beloved Julie and the darker passions of Baxter's whip. Now, however, a more serious matter has arisen. The young girl has come to the notice of the formidable Lady Mathom; the fabulously rich and enigmatic matriarch who is the real power in the valley. Jennifer is invited to visit the vast edifice of Mathom Hall to meet this strange, almost mythical figure, with no idea of why the woman should take such an interest in her.